The last review for Batman week. Box. MSRP is $19.99, which gives us a $0.10 Price per Piece. Parts 1. That Tri-Ball Joint makes another appearance. Parts 2 . Sand Green! Hinge Plates and Macaroni Tubes are cool too. Parts 3. More Sand Green! Parts 4. Look at all that Light Blue. Build. The color selection isn't great but it's functional. Score: +15 (A). A really good score for a licensed set. The last polybag review for Batman week. Bag. MSRP is $3.99, which gives us a $0.08 Price per Piece. Parts. Plenty of Plates and Tiles. the new Chima Gun stand out to me. Build. Station. Yeah, I'm not impressed either. Score: +10 (A-). A little bit lower, but not bad. Continuing Batman week with another polybag. Bag. MSRP is $4.99, which gives us a $0.07 Price per Piece. Parts. Plenty of Plates, and Jumpers, some Brackets, Slopes, Tiles, Rims, Tires, Bar Plates, Clip Plates, and Technic bits. A couple Lampholders, Clip Tiles, and a Truncated 2x2 Cone round out the fun bits. Score: +20 (A+). Once again, very good for a licensed set. Let's continue Batman week with another semi-rare polybag. Bag. MSRP is unknown because this was a giveaway at the Lego store in January. Let's call it $4.99 for argument's sake, which gives us a $0.12 Price per Piece. Parts. Plenty of Plates, an Octagonal Bar Plate, some Slopes, Brackets, Modified Tiles, Bar Plates, Clip Plates, a 4x4 Dome, a 4x4 Round Brick, a couple Pneumatic Hose Connector w/Axle Connector, Technic Axle/Pins, and a Printed Batman Logo Tile. Build. I went with the Bat Signal. It'll make a great Station. Score: -5 (B-). About average for a licensed set. Let's start Batman week off with a semi-rare polybag. Bag. MSRP is unknown because this was a giveaway at the Lego store in January. Let's call it $4.99 for argument's sake, which gives us a $0.06 Price per Piece. Parts. Plenty of Plates, Slopes, and Tiles. A couple of Lampholders, Headlight Bricks, Hinge Bricks, and Clip Tiles. Some Cones, Brackets, and Lightsaber Handles. A 1x4 Brick w/Studs on Side, Motor Brick, and Mod. Plate w/Arm Up, finish out this treasure trove. Score: +20 (A+). Very good for a licensed set. It's Friday, so let's close out the week with the last review of the last set of the last Tribe of the last Series of Mixels. Bag. MSRP is $4.99, which gives us a $0.08 Price per Piece. Parts. I don't think we've seen Propeller Blades before. Plenty of Slopes, Brackets, Bricks, Plates Clip Plates, Bar Plates, and Jumpers. A few other oddball parts as well. Build. This Frame was built pretty quickly. 2Rd+d8/2G/2W. Score: +20 (A+). The final top score for the Mixels line. Sorry about dropping this a little late in the week. I had to get the reviews out of the way first. Target is running a BOGO40% Off sale on Friends, Star Wars, City, and Duplo sets this week. If it's like last week's sale it'll stack with Clearance prices. Also, if you get two of the same set it's effectively 20% off each. Toys'R'Us is running a 20% off select Lego sets sale. There's a few good deals here. Penultimate review of the last Tribe of the last Series of Mixels. Parts. A Minifig Ice Cream Cone and Axle Ball Joints immediately jump out at me. Plenty of Slopes, Bricks, Tiles, and Plates, some Clip Plates, Ball Joints, Levers, Technic Axle Hole Bricks, New Headlight Bricks, and Brackets. A Tooth Plate, Double End Bar Plate, Jumper, and Modified Plates w/Studs on Side round it out. Frame but the parts weren't speaking to me. Score: +20 (A+). Another top score. Let's try and finish out the last Tribe of the last Series of Mixels. Parts. 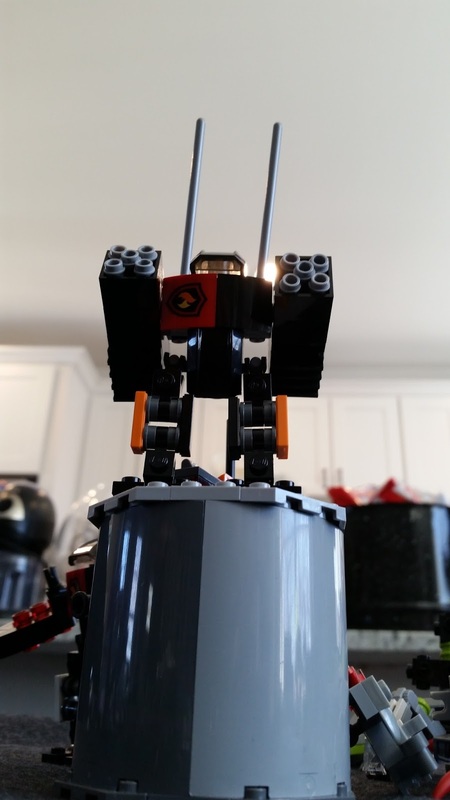 A few Bricks, Round Bricks, Brackets, Plates, Clip Plates, Barbs, Slopes, and Exo-Force Arms. A couple Bar Claws, Radar Dishes, Bar Plates, Printed Tiles, and Apollo Studs. An Octagon Bar Plate, a "Roll Cage Bar", and a Friction Ram. and extra leg Movement (2Rh/2Rd/1G/2W). Score: +20 (A+). A good start for the run to the finish. The Usual Suspects got together this last weekend for our first game of the year. Weather, life, PAX East, and other reasons had prevented us getting together before this. Occam's Spork (4 Frames & 10 Systems) = (7 Points per Asset) * (6 assets) = 42 points. Orange -- 2W + SSR (x3). White Chaser -- 2Rd+d8/2G/2W + SSR. Pink Soldier -- 2Rd/1B/1G/1Y?2W + SSR. White Recon by Fire -- 2Ra+d8/2Y/2W. Tom (6 Frames & 24 Systems) = (3 Points per Asset) * (8 assets) = 24 points. Pink Brawler -- 2Rd+d8/2B/2W. + SSR. Brown Recon by Fire -- 2Ra+d8/2Y/2W. Orange Recon by Fire -- 2Ra+d8/2Y/2W + SSR. Events of Turn 1 (DDC@11): Tom's Pink frame hits Narbey's Red frame for 4 damage. My White frame hits Tom's Orange frame for 2 damage as it moves towards one of Narbey's Stations. Tom's White frame hits Narbey's Yellow frame for 4 damage. Narbey manages to return fire with his White frame and hits Tom's Pink frame for 2 damage as it engages Narbey's Red frame. Occam's Spork's White frame hits my Purple frame for 1 damage as it charges forward towards his Station. Events of Turn 2 (DDC@8): Occam's Spork's Orange frame hits my Pink frame for 2 damage after dealing 1 hit to the terrain it was hiding behind. I return fire for 2 damage. My Orange frame then hits his White frame for 1 damage. Tom's Orange frame hits my Purple frame for 2 damage. My White frame hits Tom's Pink frame for 2 damage. Tom's Brown frame hits Narbey's Red frame for 2 damage, destroying it, and also hits his Orange frame -- which was acting as cover -- for 1 damage. Narbey's Orange frame hits Tom's Pink frame for 1 damage, destroying it. Tom retaliates with his White frame attacking Narbey's Lime frame for 3 damage. Which then attacks Tom's Orange frame for 2 damage. Tom then attacks with his Green frame hitting Narbey's Lime frame for 5 damage, destroying it, and seizing his Station. Narbey counterstrikes with his White frame at Tom's Green frame for 1 damage, which then does the Station Dance negating it. Tom's Lime frame hits Narbey's Yellow frame for 5 damage, destroying it. My Green frame hits Occam's Spork's White frame for 2 damage. Occam's Spork's Red frame then attacks my Purple frame for 4 damage, destroying it. Events of Turn 3 (DDC@5): Narbey's White frame targets my Green frame and hits my Pink frame for 1 damage. Tom's Orange frame hits Narbey's White frame for 1 damage. Tom's Lime frame hits Narbey's White frame again for 3 damage. My Lime frame hits Tom's Orange frame for 1 damage. Tom's Brown frame hits Narbey's White frame for 1 damage, destroying it and seizing his Station. My White frame hits Tom's Orange frame for 1 damage, destroying it while it runs to Narbey's Station. Tom's White frame hits Occam's Spork's White frame for 2 damage and it does the Station Dance. My Green frame hits Occam's Spork's Orange frame for 5 damage, destroying it. Tom's Green frame moves towards Occam's Spork's Stations, taking cover behind one of the columns. Events of Turn 4 (DDC@2): My Green frame hits Occam's Spork's White frame for 2 damage, destroying it, after destroying the cover it was behind. I seize his Station. My Orange frame hits Tom's Green frame for 1 damage and deals the cover it was behind 1 damage. My White frame hits Tom's Lime frame for 3 damage. Tom's Brown frame hits Occam's Spork's Red frame for 2 damage. Tom's White frame hits it again for 1 damage. The Doomsday Clock gets ticked to zero. Lord of the Battlefield (not really). We DID use Single Shot Rockets. I think that everyone managed to use all of the SSRs in this game. I lost my first Station before the game even started. Both Tom and Occam's Spork tried new team compositions for this game. Things really broke loose in the second round with five frames being destroyed. Tom had the heavy hand when it came to Damage rolls. He dealt out 41 points of damage over 15 separate attacks.